As the retirement plan industry has evolved, so has the structure of investment vehicles used in 401(k) plans. Collective Investment Trust funds (CITs) have been available for decades (first launched in 1927) and were offered in very early 401(k) plans. However, the early versions of CITs provided investors little access to underlying holdings data and were valued infrequently, typically only once per quarter. As a result, CITs were quickly overshadowed as mutual funds, with daily valuations and greater transparency, became the more popular option. In fact, more than half (54.1%) of all 401(k) assets remain invested in mutual funds as of 2013, based on the 2014 Cerulli Quantitative Update1. However, given the recent focus on retirement plan fees and full disclosure, and in light of technological advances, CITs may be gaining market share. Only available through certain qualified retirement plans, CIT assets reported by Morningstar, Inc. equaled approximately $1.5 trillion as of the third quarter of 2014. 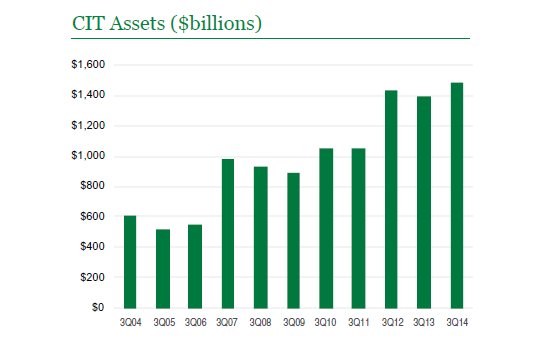 This represents a significant increase from a decade ago; CIT assets reported by Morningstar, Inc. equaled just $607 billion as of the third quarter 2004. This paper defines CITs, discusses how they are structured, and illustrates how they compare and contrast with mutual funds. While there are several types of commingled or pooled vehicles, a CIT is a trust that combines assets for multiple investors meeting specific requirements as established in the CIT’s regulating document, the Declaration of Trust. A bank or trust company exercises authority over all the administration, management, and investment decisions for the trust. CITs are bank products. CITs at nationally chartered banks are regulated by the Office of the Comptroller of the Currency (OCC), which is part of the U.S. Treasury. CITs at state chartered banks and trust companies are regulated by their respective state authorities and may also be subject to oversight by the Federal Reserve Board or the Federal Deposit Insurance Corporation. CITs may also be subject to oversight by the Internal Revenue Service (IRS) and the Department of Labor (DOL). CITs are not regulated by the Securities and Exchange Commission (SEC), as they are exempt from registration under both the Securities Act of 1933 and the Investment Company Act of 1940. Simply, A1 funds, or common trust funds as they are generally known in the industry, are funded by banks or affiliated banks; A2 funds or CITs are funded by qualified retirement plans and are exempt from federal income tax. For purposes of this discussion, we refer strictly to A2 Funds or CITs associated with qualified retirement plans. CITs are similar to mutual funds or other pooled investments in that qualified investors with similar objectives merge their assets into a single portfolio. The portfolio manager or sub-advisor hired by the bank then invests the assets according to the set investment objectives. Despite being offered by banks, CITs assume the same investment risk as other investments and are not guaranteed by the bank or by the Federal Deposit Insurance Corporation (FDIC), the independent agency of the federal government that insures deposits in banks and thrift institutions. As previously mentioned, investment in CITs is limited to certain types of retirement plans. 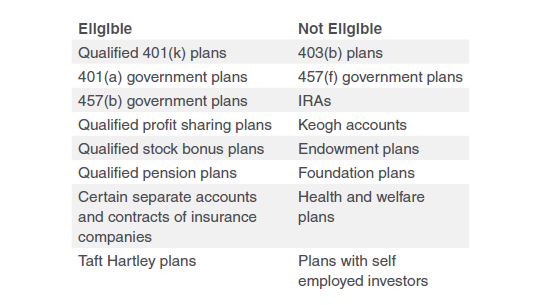 See the table that follows for a comparison of plan types that are eligible versus plan types that are not. CITs are not new to the retirement plan industry. In fact, they have been a preferred option for many defined benefit plans since Congress amended the Internal Revenue Code in 1936 to provide tax-exempt status to certain bank CITs. A later development further increased their popularity, when in 1955 the Federal Reserve authorized banks to combine funds from pensions, profit sharing and stock bonus plans, and the IRS determined that such funds could be exempt from tax. As a result, CITs became the popular choice for defined benefit plans and remained so for many decades. The first CITs were pools of securities that were traded manually and typically valued only once per calendar quarter. In addition, they were limited to a few investment objectives, primarily concentrated in Stable Value. Since early CITs were unique to each bank and portfolio manager, information was not publicly available. In contrast, as of 12/31/2014, there are over 3,2002 CITs open for investment and covered by Morningstar, Inc. Furthermore, those CITs represent 75 different Morningstar Categories. When 401(k) plans were developed in the 1980s, CITs were an option in many of the early plans; however, given the operational constraints of CITs and their lack of widely available information, mutual funds soon became the preferred vehicle in most 401(k) plans. Mutual funds offered many of the features that CITs lacked. They provided a wider array of investment objectives, were traded and valued daily, were marketed to retail and institutional investors, and were easily followed in the news media. An important development for CITs occurred in 2000 when the National Securities Clearing Corporation (NSCC) added CITs to its mutual fund trading platform, Fund/SERV®, allowing CITs to trade daily and as fluidly as mutual funds. In recent years, many employers have frozen their defined benefit plans as 401(k) and other defined contribution plans have grown to become the primary retirement savings vehicles. Given that popularity, the structure and cost of 401(k) plans has come under greater scrutiny. As a result, many plan sponsors are once again considering CITs as investment alternatives. See the table that follows for a summary of key factors that have helped to increase the popularity of CITs in today’s market. Assets in the defined contribution market are invested in a variety of vehicles, including mutual funds, separate accounts, CITs, annuities, exchange traded funds, and company stock. To date, mutual funds have captured the majority of the assets but market data indicates that the demand and usage of CITs has notably increased. The increase in demand for CITs can be attributed to multiple factors. First, since defined contribution plans have become the primary employer-sponsored retirement savings vehicle, employers are now considering multiple investment solutions, including mutual funds, CITs, and other vehicles. In addition, institutional-favored options providing lower cost solutions, like CITs, are in greater demand as lower cost solutions typically outperform higher cost alternatives (all else being equal) and participants have become increasingly more results driven. Recent scrutiny of plan costs and regulation regarding disclosure of investment fees have also added to the popularity of CITs as alternatives. Furthermore, CITs can often provide greater flexibility when compared to mutual funds with regard to what they can invest in and how they can be priced. Finally, as previously mentioned, technology has played a major role in making CITs easier to use through both trading on standard platforms and publishing information through widely available databases and media. All of the above have added to the allure of the more institutionally constructed CITs. Additional characteristics of CITS are discussed in the section that follows. Like other pooled investment vehicles, CITs are designed to streamline management and mitigate risk by combining assets from multiple accounts with similar investment objectives. As such, CITs and mutual funds share a number of similarities. For example, both are pooled investments with professional management, which are subject to some form of regulation. Each are governed by a controlling document (a declaration of trust for CITs and a prospectus for mutual funds) that provides the basis for investment objectives and how they will be operated and managed. As previously mentioned, the universe of CITs has expanded, and a wide variety of investment objectives can now be found in either vehicle. Data is more widely available today than in the past for CITs, and fact sheets now tend to be readily available for both vehicles. Finally, trading for both CITs and mutual funds is automated, and standardized transaction processing is available for both CITs and mutual funds through the NSCC’s Fund/SERV® trading platform. The most obvious difference between CITs and mutual funds is how they are regulated. Mutual funds are regulated by the Securities and Exchange Commission (SEC) under the Securities Act of 1940, whereas CITs are regulated by the OCC and state banking authorities. As a result, CITs do not have the additional compliance costs associated with SEC-required disclosure and filings. Being exempt from SEC registration also allows CITs to avoid the costs associated with other activities the SEC requires of mutual funds, such as creating and delivering proxies, prospectuses, and Statements of Additional Information. 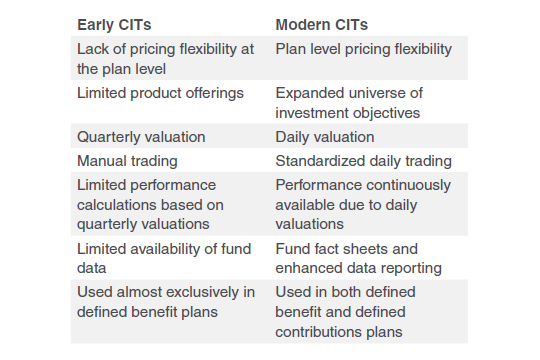 Furthermore, given their exemption, CITs may be quicker and less expensive to create, and may provide more flexiblity with regard to pricing than mutual funds, as CIT fees may be negotiable in some cases, especially for larger institutional investors. Investment expense is typically the largest expense of a retirement plan; thus, the lower expenses of CITs provide potentially considerable savings that can be passed on to plan fiduciaries and participants. Another key difference between CITs and mutual funds is the size and type of each product’s investor base. Specifically, mutual funds generally do not have eligibility restrictions and can usually be purchased by most investors (i.e., after meeting the minimum initial investment and other possible criteria). For that reason, mutual funds market to a larger base of investors and have broader distribution outlets (e.g., retail investors, financial advisors, institutional investors); therefore, mutual funds incur additional marketing and distribution costs. In contrast, CITs are restricted to certain retirement plans and, therefore, have limited marketing and distribution needs and expenses. The final distinction to be made between CITs and mutual funds lies within their respective operations, namely availability and reporting. While data is more readily available now than it has been historically for CITs, there are still some limitations on what the average investor can find on a CIT as compared to the information that can be obtained on mutual funds. While CITs have grown with regard to investment objectives available, there is still a much larger selection of investment styles available via mutual funds. Finally, from a fiduciary perspective, trustees of a CIT are considered fiduciaries under the Employee Retirement Income Security Act (ERISA) and are held to ERISA fiduciary standards, while mutual funds managers are generally not held to ERISA fiduciary standards. In this capacity, the bank, as trustee, must act solely in the best interest of the plan participants and beneficiaries and is generally prohibited from making decisions that are in the bank’s best interest, but not in the best interest of the plan invested in the CIT. For additional information on fiduciary standards and ERISA, please consult an ERISA Attorney. When it comes to retirement plans, fiduciaries are charged with selecting an appropriate number of investment options as well as a suitable mix of investment objectives so that participants have access to the right balance of choices to create an appropriate asset allocation design. However, as investment platforms continue to add mutual funds, CITs, separate accounts, and other investments to the mix of options available to retirement plans, fiduciaries have the added responsibility of selecting the vehicle type. It is important to remember that investment vehicles should be selected based on what is in the best interest of an individual plan, its participants and beneficiaries, as each plan’s unique situation may dictate which investments are appropriate. As a result, CITs and mutual funds should both be considered whenever possible. In addition, when selecting options for a participant directed retirement plan, plan fiduciaries need to consider many factors, not just cost. For example, the provider’s available investment options, trading and operational considerations, current market trends, and the regulatory environment all play key roles in the decision making process. Given the multiple variables, there is generally not one option that will necessarily be a better choice; although in some situations, a plan may not be eligible to use CITs, making mutual funds the only alternative. Regardless of which vehicle is selected, plan fiduciaries must act in the best interest of plan participants and their beneficiaries, and make decisions utilizing a prudent decision making process that is well documented. Therefore, it is always important for plan fiduciaries to fully understand all the available options and any other factors involved when selecting investments for their retirement plans. Manning & Napier Advisors, LLC provides investment advisory services to Exeter Trust Company, Trustee of the Manning & Napier Collective Investment Trust funds. The Collectives are available only for use within certain qualified employee benefit plans. Source: © Morningstar 2015. All rights reserved. The information contained herein: (1) is proprietary to Morningstar and/or its content providers; (2) may not be copied, adapted or distributed; and (3) is not warranted to be accurate, complete or timely. Neither Morningstar nor its content providers are responsible for any damages or losses arising from any use of this information, except where such damages or losses cannot be limited or excluded by law in your jurisdiction. Past financial performance is no guarantee of future results. 1Cerulli Associates, Cerulli Quantitative Update, Retirement Markets 2014: Sizing Opportunities in Private and Public Retirement Plans. 2This number includes all share classes open for investment.